U.S. Politics are systemically flawed due to the amount of capital needed to run for public office. It dictates our candidates, our policies, and creates a system where our elected officials are beholden to their sponsors. Our challenge is systemic, and our legislators demonstrate no interest in policies to develop alternatives. We believe that if embraced by the public, a free, open, and issue based election campaign platform could dramatically reduce the cost of running for elected office. Creating a highly energized and participatory democracy is necessary to create a world where legislative and societal change does not rely so heavily on crisis. OurSociety will empower more people than ever before to become engaged civically. We will accomplish this by making the process easier and more convenient than ever before. States were designed laboratories of experimentation, but our lab equipment needs an upgrade. OurSociety gives all of us the ability to use our data for the greater good. By analyzing the information shared we can identify best practices working for communities and provide that information to all communities and elected officials engaged with the OurSociety Experiment. We believe that we have more in common than we’re given credit for. 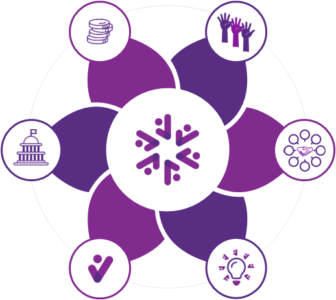 OurSociety incorporates detailed Social Value analytics to identify collaborative trends among Americans – allowing us to identify a more unified national direction. We’ll analyze the aggregate social values by region and provide that information to the public, for free. It’s our data; it belongs to all of us. Together we can reimagine a society that focuses on cooperation and collaboration. Community matters. Every municipality has access to tremendous amounts of untapped potential in the perspective and engagement of their constituents. We’re experimenting with concepts to make local communities more engaging and easier to be involved with. We believe that social structures such as Democracy, the Market Economy, Laws Regarding Property & Contract, Educational Institutions, and more are all types of social technology. We view challenges through an objective lens, focusing on bringing possibilities into reality through technology and action.